A unique iron – nitrogen bonded complex which provides a quick green- up of turf without overstimulation of growth and without wheel marks or blackening. Ferrosol in liquid form can be mixed easily in water and is immediately available for spray or drench application. Ideal for use at any time when turf is in need of a green-up boost and in the autumn will harden the turf and strengthen it against disease. Ferrosol will tank mix with all Aquatrols Organic Liquids and with all Aquatrols NPK Super Concentrate liquid fertilisers. Can be used on all fine turf areas. 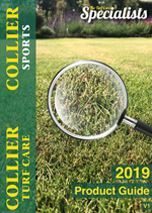 Instrata is a robust, high performance turf fungicide that contains three powerful active ingredients for optimal contact and systematic activity. Instrata, a broad-spectrum foliar fungicide approved for the control of Microdochium Patch (Fusarium), Dollar Spot, Brown Patch, and the reduction of Anthracnose. Banner Maxx is a broad spectrum foliar fungicide which controls Dollar Spot, Brown Patch & more. Preventative, curative and ideal for spring and autumn use. Heritage Maxx is a high performing fungicide approved for the control of Fusarium Patch, Take-All Patch, Anthracnose & more. Provides long term prevention..